Non-Human Primate Unit, Investigación Biomédica Aplicada (INBIOMA) S.A.S. de C.V. Structural and functional organization in living organisms relies on their communication systems, which permanently carry information to the cells within the organism and govern their entire behavior from simple actions to complex behaviors. Rhesus monkeys are one of the animal species most commonly used in biomedical research due to their phylogenetic closeness to humans. Also, the social structure and behavior found in these monkeys are very similar to those of humans, and this makes them an excellent comparative and evolutionary model of study mainly for their importance in the construction, structure and maintenance of social groups. 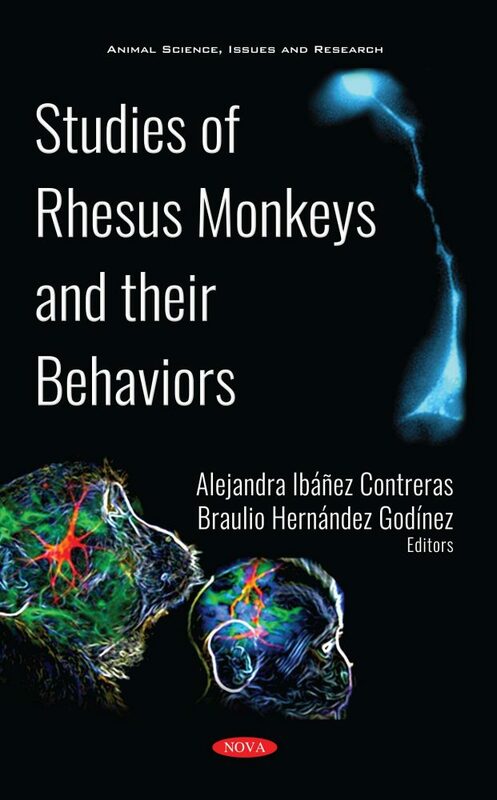 This book is a compilation of different research works that attempt to understand the underlying mechanisms involved in the expression of characteristic behaviors in the primate order, and the authors hope to unify both the biological and social sciences. Keywords: Macaca mulatta, Behavior, neuronal generators, ontogeny states, Myelination, corticospinal tract, social interactions, Manual laterality, manual manipulation, sleep, evolution, simultaneous chaining paradigm, comparative cognition, chunking, motor imagery, motor system, primates body language, Social organization. Audience: Students, specialists in biological areas, professionals in human and animal health, primatologists, veterinarians, Physical anthropologists, psychologists.